Artificial intelligence is rapidly changing many aspects of how we work and live. (How many stories did you read last week about self-driving cars and job-stealing robots? Perhaps your holiday shopping involved some AI algorithms, as well.) 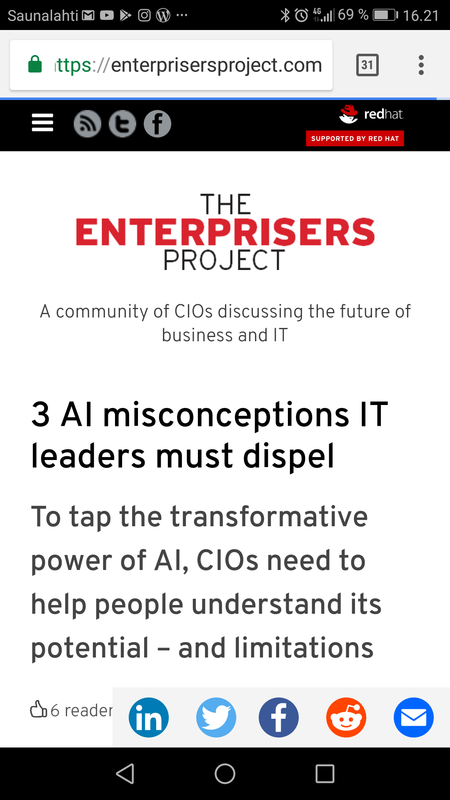 But despite the constant flow of news, many misconceptions about AI remain. Today, selling custom chips for artificial intelligence is still a small business. Intel, the largest manufacturer of computer processors, has appraised the current market at $2.5 billion, one half of one percent of the estimated value of the 2018 global semiconductor market. But startups are still raising billions of dollars of venture capital to plant a stake in the market, which research firm Morningstar says could be worth $20 billion in 2021. Leaders of three R&D organizations, Imec, Leti and SRC, discuss the latest chip trends in AI, packaging and quantum computing. AI + IoT = AIoT — What Lies Behind the Buzzwords? Buzzwords such as the internet of things (IoT), edge computing, and artificial intelligence (AI) have been circulating for quite some time. They tend to be thrown around quite liberally and can come across as somewhat nebulous to the average reader. Researchers borrowed equations from calculus to redesign the core machinery of deep learning so it can model continuous processes like changes in health. Aalto-yliopistossa kehitetty ARTIST-tekoäly (Artificial Intelligence for Spectroscopy) mullistaa sen, miten yksittäisten molekyylien spektri eli reaktio valoon voidaan selvittää. But how deeply AI penetrates different market segments and technologies, and how quickly it pushes into the mainstream, depend on a variety of issues that still must be resolved. In addition to a plethora of technical issues, there needs to be progress in sanitizing data sets, resolving political, legal and ethical issues, and instilling trust in machines. None of these challenges is insurmountable, but a failure to deal with any of them will could delay the adoption of AI and slow or prevent it from reaching its full potential. But with so much memory on the chip—in some cases it accounts for half the area of large SoCs—little changes can have a big impact. This is particularly true in AI applications, where small memories are often scattered around the chips with highly specific processing elements in order to process massive amounts of data more quickly. The challenge now is to minimize the movement of that data. What differentiates AI chips from other architectures is a relatively simple main computing element—the multiply accumulate (MAC) block. This block is parallelized and repeated thousands of times in an ASIC. Because of this replication, any small improvement made in the area or power, for example, has a huge overall effect in the chip, Macian explained. Should AI Mimic Real Life? What the human body can teach us about the importance of communications. But what does the human body do? Does it have distributed intelligence or does everything go through the brain? Admittedly, communications within the body isn’t clogged with huge amounts of high-resolution video, meaning that it may not have the same bandwidth constraints, but here also is one departure between the two architectures. The human only transmits or processes the least amount of data possible. Of that 4K image on the screen, how much do the eyes actually take in and how much gets processed? It would appear that human vision works in an incremental fashion, first using the minimum amount of data necessary to make an initial determination. If there is uncertainty, then more data is brought in and this goes on until either a “match” is made, or we decide what it is closest to, and how it differs in an attempt to make an educated guess. How may that translate into ML – perhaps using the minimum accuracy first, say 4-bit, and then working its way up to longer data lengths only if necessary. That does not address distributed intelligence. The eyes and brain are too close together to effectively separate them. But movement and other body functions are different. I don’t think that many of us have really grasped the implications of applying today’s emerging artificial intelligence (AI) and deep-learning technologies to tasks that are difficult to address any other way. For example, my chum Jay Dowling just sent me a link to an article describing how a group of engineers are working on a system that can translate brain signals directly into speech. Humans and other animals possess a very useful awareness of their own bodies. Relex is not disclosing its valuation but from what I understand it’s a minority stake, which would put it at between $400 million and $500 million. As an aerospace manufacturer, Airbus is taking proactive steps to improve performance and reliability in the area of aircraft maintenance. It is doing this by migrating historical maintenance information from aircraft and fleets to a cloud-based data repository known as Skywise. Seattle-based KenSci, which helps hospitals predict mortality risk using AI, raises $22M Series B led by Polaris Partners — Transitioning an elderly patient to palliative care can be a difficult decision for caregivers, but it’s one that families and clinicians across the globe make every day. What works, what doesn’t and why. Geoff Tate, CEO of Flex Logix, talks about benchmarking in edge devices, particularly for convolutional neural networks. Ruotsalaisen Linköpingin yliopiston tutkijat ovat kehittäneet orgaanisen transistorin, joka matkii aivojen toimintaa. New research is examining the use of artificial intelligence to handle the calculations necessary for quantum computers to function. The currency of tomorrow isn’t what you think: It’s not cold hard cash, precious metals, land or even cryptocurrency – it’s data. In the very near future, every company in the world will either buy or sell data as this corporate asset continues to gain value. Is the artificial intelligence hype a bubble of misinformation? InsightsAtlas says yes.